The leaders of France and Germany have pledged to intensify their co-operation against a US-led war against Iraq. The decision was announced in Paris, at a joint news conference by President Jacques Chirac and Chancellor Gerhard Schroeder on the 40th anniversary of the two countries' post-war friendship treaty. In an example of the Franco-German opposition, the Nato alliance was unable to approve a US request to advance military planning in the event of war. Both the US and Britain are sending troops to the Gulf region in preparation for a possible attack on Iraq, which has been ordered to show it has no banned weapons of mass destruction. And in a further sign that that a military intervention may be unavoidable, President George W Bush threatened with war crimes charges any Iraqis who used banned weapons in a possible conflict. US Defence Secretary Donald Rumsfeld told reporters that the president had made no decision to go to war - the US was waiting to see whether the United Nations process of inspections was yielding any results. The UN Security Council is to hear the first report on inspections on 27 January and there have been calls for the inspectors to be given more time to verify Iraqi claims that it had destroyed banned weapons. But Mr Rumsfeld said inspectors were not "discoverers" trying to find things that had been hidden - that kind of hunt would take years. He said the test ought to be determining whether the Iraqis were co-operating not whether the inspectors had discovered anything. Speaking on French television, President Chirac said "an extra delay is necessary" to give the weapons inspectors more time to search Iraq for banned arms. He said he backed a request by the UN's chief nuclear weapons inspector, Mohamed ElBaradei, for an extension of "several months" for the inspectors to carry out their work. Earlier, Mr Chirac said France and Germany "have the same judgement on this crisis" - the decision had to be taken by the Security Council and everything ought to be done to avoid war. He said France was co-ordinating its positions "closely" with Germany - to which it hands over the presidency of the Security Council next month. Germany has indicated that it will not support a UN resolution in support of military action. 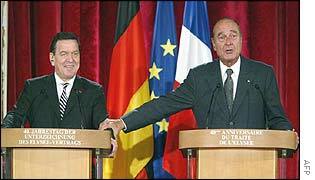 Mr Chirac did not say whether France would use its power of veto. The BBC diplomatic correspondent Barnaby Mason says Mr Chirac was exaggerating slightly when he said their views were the same. He says Mr Schroeder has abandoned Germany's former automatic loyalty to the United States to take up an even firmer position than France - traditionally Washington's most awkward Western ally. On Wednesday, Nato ambassadors declined to agree to an American request to advance military planning, particularly to protect Turkey - the only Nato member bordering Iraq. Reports said ambassadors agreed in principle, but France and Germany led other European allies in opposing the timing for such a request. Commenting on Franco-German opposition to US policy on Iraq the US defence secretary dismissed the alliance as "old Europe". There are many more countries in Europe, Mr Rumsfeld said, who supported the US. On Wednesday, President Bush cautioned "any [Iraqi] general or soldier against using weapons of mass destruction on our troops or innocent lives within Iraq. "Should any Iraqi officer or soldier receive an order from [Iraqi President] Saddam Hussein or his sons or any of the killers who occupy the high levels of their government, my advice is don't follow that order," Mr Bush said. "If you choose to do so, when Iraq is liberated, you will be treated, tried and persecuted as a war criminal." "German troops will definitely not be going to Iraq"
"We're all working to find a non-war solution"